An excellent family movie. There was no swearing, blood or killing in the movie even though it was based on the First World War. How all movies should be. This animated movie is a refreshing change from Hollywood and Disney. It is great for children to learn about history, and is very entertaining. It delicately handles a difficult period of time in history through the eyes of a little dog who just wants to makes things better. I wanted to see a light movie and this one really surprised me how great this one is. I wish more people would see it as my theatre was empty. They could have easily made this into an adult war film but made it light for the whole family. 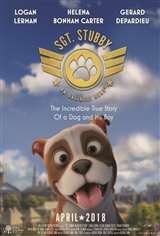 Great story, simple animation and one of the cutest animated dogs to fall in love with. Heartwarming true story for the whole family.